Star Wars Celebration is in full swing down in Chicago. I've been on hand covering the big panels, such as Episode IX, which we now know to be titled Star Wars: Rise of the Skywalker. But the thing about events like this is there are seriously so many things going on outside of the highly splashy stuff. Case in point, I went and checked out the Hasbro panel and oh man, was it worth it. Given what the legendary toy company decided to show off at the panel, it's safe to say literally any Star Wars fan could go broke very easily, should they choose to showcase their love for the franchise by scooping up this kind of merchandise. I'll start off by saying, I'm no expert. I loved Star Wars toys more than anything growing up. It was my way to live out my dreams in a galaxy far, far away in my bedroom in a time when it wasn't cool at all to like this stuff. That said, Star Wars toys have always been a huge cornerstone and this panel was purely about that. No fluff. No nothing. Just reveals and details about those reveals. So I'm just going to go in order breaking down what we were shown. I've got pics of everything from the panel below that I shared during my live tweeting session at the panel as well, so everyone can see what I'm talking about. First off were two Celebration exclusives, in the form of Obi-Wan and Darth Maul, given that we're dangerously near the 20th anniversary of the release of The Phantom Menace. They're definitely made for 90s fans, especially in the case of the Kenobi figure. Though, Maul has enough lovers out there that I could see this one going on eBay for some dough later on. Moving on, they showcased a new lightsaber line which is really elaborate called Lightsaber Academy. People can build them piece by piece and in the video we were shown, they even had Kyber Crystals! It was really neat. Aimed at kids, but certainly some man-children out there (myself included) will be looking into these when they hit shelves. Elsewhere, looking ahead at what Hasbro is going to do for The Empire Strikes Back 40th anniversary, a fan poll determined that Dagobah Luke is the winner! So that's coming, but we didn't get a look at the figure just yet. Then they showed off six new Black Series figures coming this summer, including Padawan Obi-Wan and some Star Wars Rebels favorites in the form of Chopper and Ezra. We're also getting a series of three figures from the popular Doctor Aphra comic from Marvel, including the titular character and her evil droids, Triple Zero and BT-1. Those on the panel explained that figures like this were made possible because of the long break in movies between Solo and Episode IX. Moving on, we got a look at a Clone Commander Obi-Wan in his Stormtrooper gear (yes, this panel was Kenobi heavy). This one will be exclusive to Walgreens and hits shelves this summer. Then we were shown four more Black Series figures in the form of a Scout Trooper, ala Return of the Jedi, another new Darth Maul, a Revenge of the Sith era Anakin and Yoda. Again, as always with the Black Series, they look great. A big theme at the panel was everyone talking about the unbelievable painstaking effort that goes into getting this stuff right. There are also four figures coming in vintage cardback packaging, including Crait Luke from the end of The Last Jedi, a Rogue One Death Star Gunner, a Rogue One Tank Commander and R2-D2. Next up was perhaps the coolest thing from the entire panel, which is a gigantic and unbelievably detailed Jabba's Sail Barge. As a man who calls Return of the Jedi his favorite Star Wars movie, the drool on my chin was excessive when they showed us a video of this (which I've included below). It's one of the biggest sets they've ever built and there are several characters coming out to go along with it in a special three pack. They're obscure characters featured on the barge named Vedain, Vizam and Brock Starsher. They look great. There's also a new Tatooine Skiff (the little speeders riding alongside the barge in the movie), which also looks great. Palpatine, in addition to showing up in the Star Wars: Rise of the Skywalker trailer, showed up at this panel in the form of an Amazon exclusive figure with three different heads. Fun fact: this is the first time they've ever given a character three different heads. It's cool. We then moved onto one of the biggest things revealed at the panel, which is that Hasbro will have three different exclusives available at Star Wars: Galaxy's Edge when the park expansions open at Disneyland and Disney World. There's a three pack with Kylo Ren, Commander Pyre and, something totally new, a Mountain Trooper! There's a droid pack which three of the usual suspects, including C-3PO, R2-D2 and BB-8, but this one comes with DJ R3X, who old school fans will recognize from Star Tours, which is a nice touch. Lastly, there's a three pack with Rey, Chewie and, surprisingly, Hondo from The Clone Wars and Rebels, who will have a presence at the parks. And yes, there are Porgs in this pack. We then moved onto convention exclusives, which will all be at San Diego Comic-Con over the summer. Some of them will make their way around the convention circuit, but they're not going to be made commercially available. 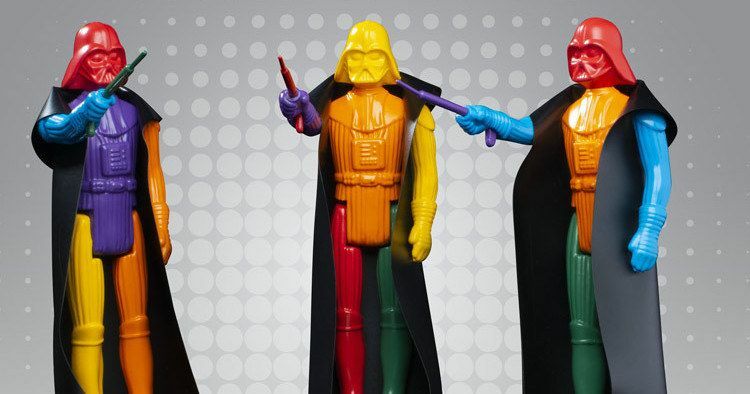 The first reveal was a very colorful Darth Vader figure, which is based on test designs Hasbro does with new figures that use random colors. Andy Warhol was talked about as a touchstone. It's certainly one of the more unique things we were shown. Then my personal favorite came in the form of a Boba Fett figure meant to honor the original Kenner figurine that helped popularize the character. Mark my words, this one will fetch a fortune on eBay in the future. Lastly, Luke Skywalker gets some love with a figure three pack that includes Stormtrooper Luke, Jedi Luke and X-Wing "Red 5" pilot Luke. These were all made with special detail and consideration. For example, the Stormtrooper Luke actually has a grappling hook. Neat, right? Lastly, we were shown a new X-Wing pilot cosplay helmet which is unreal. It has tons of features and is absurdly accurate. A couple of important notes. For one, they didn't showcase any Episode IX figures. Even though the panel took place earlier in the day, J.J. Abrams and Co. didn't reveal much, so they're still playing this one close to the chest. Someone also asked about The Mandalorian and other projects in development. It was noted that toys for that show and other projects coming down the pipeline will happen. They just weren't ready to be showcased here. To wrap things up, those in attendance were shown a super secret video and live demonstration of a prototype lightsaber toy that may never actually make it to market. While it's tough to describe, it's a very realistic looking hilt that emits a blade made of light to give it a real look, while maintaining a very authentic Jedi Knight feel, since there isn't a clunky plastic blade coming out of it. If they perfect this at some point, it will sell like gangbusters. And that's about it! Be sure to check out all of the pics below from the Hasbro panel and follow along with our coverage from Star Wars Celebration throughout the rest of the weekend. Summer wave of Black Series figures. Black Series Palpatine - three heads, lightning hands. Mountain Tropper (right), something TOTALLY new. Mouse Droid has rolling wheels. Droids, including DJ R3X from Star Tours! 40th anniversary throw back Boba Fett! Throw back to Kenner but maintains Black Series style. This will be an SDCC . Leading into these SDCC exclusive Luke figures! Adjustable mic surround sound with three speakers.